Posted on December 18, 2014 by I Never sign out at work. I headed up to my parents’ house in Drymen with the hope of an early start for a lone trip up The Cobbler to scout out some new routes and take a look at some future projects. I got up early and arrived at around 8a.m. Leaving the car in full hard-shells due to the torrential rain below 500m, I took my time walking in as I knew I had all day and wasn’t rushing to the base of a route. Ditching my hardshell into my pack I changed over to soft shell as the rain turned to snow and The temperature dropped. The whole path was flooded with all the melt water from yesterday’s thaw and only the hard compacted snow within the basin remained. 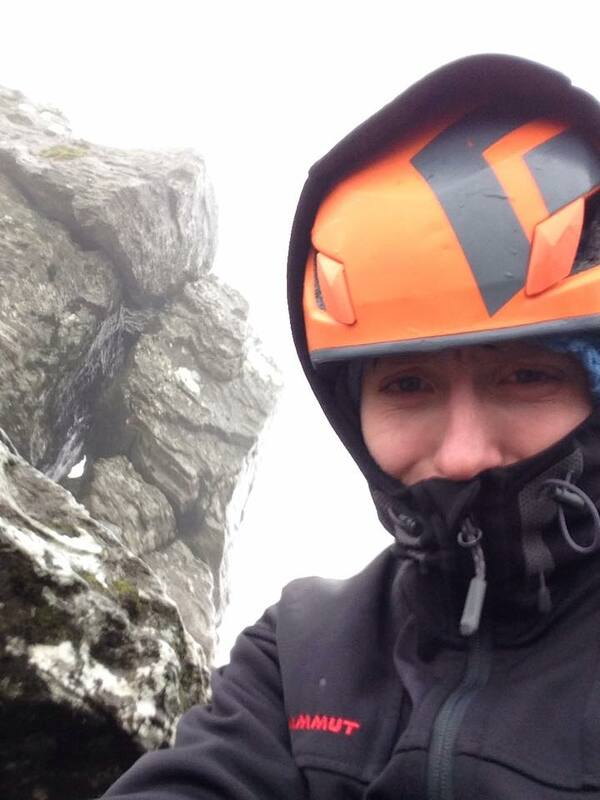 Luckily The basin was sheltered from the freezing northerly wind as it pelted the back side of the crags. I spent the day roaming around looking at a few unclimbed routes and things that I plan to become future projects later in the season when the winter conditions really kick in. 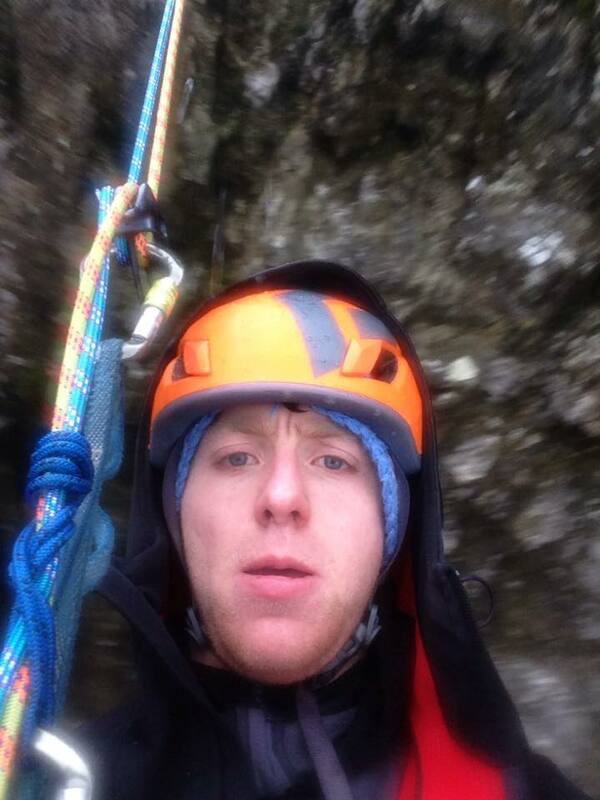 I also managed to abseil inspect a few routes such as Dave Macleod’s ‘The Cathedral’ (X,11). 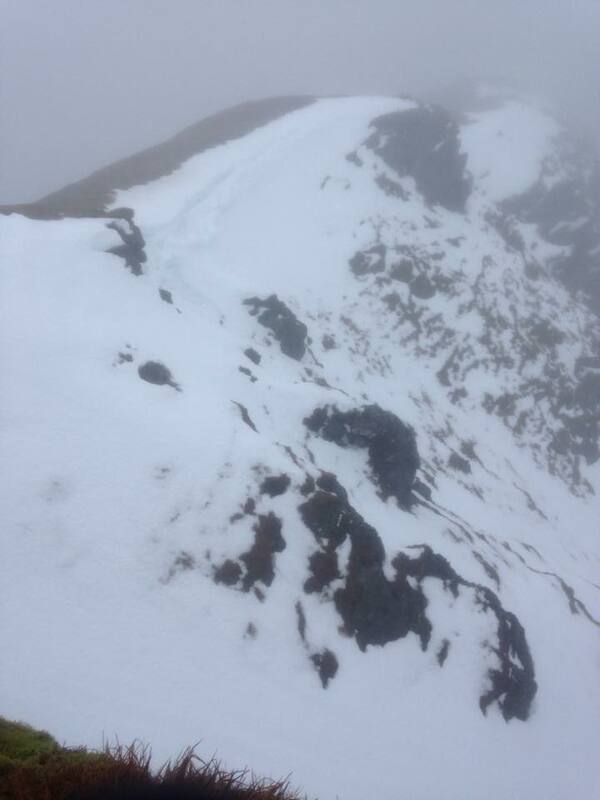 I know that abseil inspection is not ‘usual ethics’ for winter climbs but the route wasn’t in winter condition and it’s the standard of route that I think it would be foolish to no inspect it before even considering it as a future project for myself. 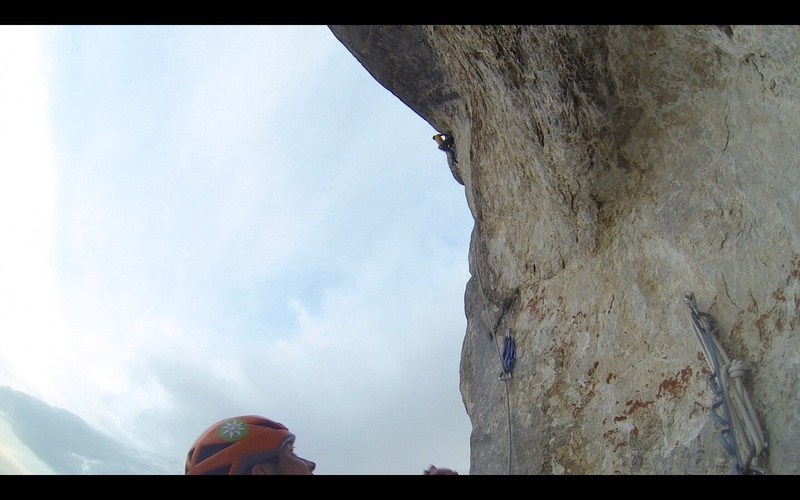 It seems out of my reach at the moment but perhaps with some more training and getting a few hard routes under my belt this season, it might make its way onto the ‘give it a try’ list someday…who knows!? If anything, today was a good ‘reccy’ day, that may have got me soaked but it all helps top up the hill fitness and keeps me true to my promise to myself that I will try and get out on the hill at least once every week this season. Posted on December 9, 2014 by I Never sign out at work. That was pretty much as simple as it was last night when Euan had realised we both didn’t start work till 6p.m. the next day and couldn’t find anything to entertain himself. It was just after 10p.m. and we’d both just returned from a day in work. We’d seen that the conditions were good but both had work the following evening and so the idea to get out tonight and start climbing early tomorrow to make it back in time for work seemed more appealing than sitting in the flat bored out our minds, regardless of the time. We packed our bags in minutes and headed up to Arrochar in the car. We arrived at The Cobbler car park only to realise that we both had notes rather than change in our wallets! The Cobblers car park usually goes by strict conduct of a pay and display meter, that comes with a hefty fine of £60 for being tight-fisted enough to not cough up the £1 fee for a 24 hour ticket. Having seen several people end up with fines from thinking they could get away with it in the past I refused to take the risk and so the hunt was on to find enough change in the car to afford a ticket. No luck, we’d pillaged the car and it just wasn’t going to stretch it. Several minutes and a few ‘Let’s just stick a fiver to the windscreen with an IOU’ ideas later, we decided we’d have to go to one of nearby hotels to change up our notes! We eventually managed to acquire a pound coin after I hassled the night guard of a local hotel to switch it for our fiver from the donation box labelled ‘Hand-Knitted Scottish Scarves’. I left the other £4 as a tip and dashed out the door…he must have thought I was mad! Finally we drove back to the car park and got our ticket. After all the commotion we finally got our packs on a left the car park just as the police turned up. Apparently it looks suspicious to be searching round a car park at 1a.m. 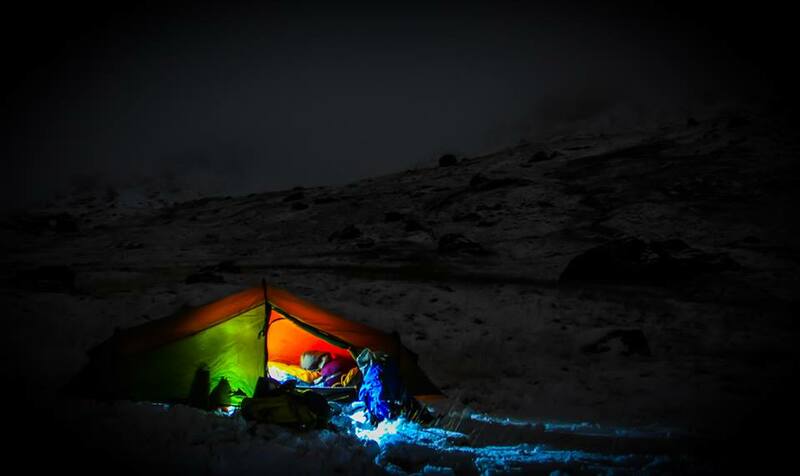 The night passed quickly as the cold took no effect on us wrapped up well in our sleeping bags that have provided comfort in temperatures ten times colder in the past. Unfortunately the moment we crawled out of our bags into the cold there was no relief from a morning brew as we’d left the stove behind to save weight on the walk in. Only half a slice of Christmas cake and a single pain-au-chocolat each was all we had to kick-start us for the day ahead. We kitted up, hid the bags and tent under some boulders and snow and started the scramble up into the basin through the white out. It wasn’t long until I noticed Euan wasn’t 100 percent. We’d only managed the first 100m of the steeper ground before he took a break to stretch his hip that had been giving him complaints on the walk-in the previous night. Having run his record time for a 10km only hours before we had left the flat, he obviously had strained something and the rise in gradient was enough to push it past a discomfort and into a progress stopper. It doesn’t take much for the two of us to know when something isn’t quite right with the other. Having climbed together for the last 10 years, we know when the other’s had enough and doesn’t want to say. Euan being his usual self continued on through the pain, obviously not wanting to hold us back and seeing my excitement for the first outing of the season, he probably didn’t want to ruin my day as well as his. We chilled out at some nearby rocks and grabbed some water before discussing what the plan was. When we left the night before we thought we had been ingenious, managing to sneak our trip into the small amount of spare time that we had. Expecting to return to Glasgow with a smug look on our faces having managed a climb before our shift. This made it more of a shame that are first winter jaunt ended prematurely but with worse weather coming in and with Euan’s hip playing up, sometimes you need to know when you’re beaten. We called it a day and started back down the hill towards where we had stashed the bags. A slow and relaxed descent pace saw us at the car and on our way back to Glasgow before midday had struck, more time to rest up and grab some food before heading into work. It might not have been the day we were expecting but I guess we can call it a ‘warm up run’ to the upcoming season. Why on earth do we do this!? Posted on January 22, 2014 by I Never sign out at work. So firstly, I’d like to say sorry for not keeping my page up to date, I’m entirely useless and extremely forgetful! As I haven’t written anything recently I thought I’d give you some food for thought. As the winter season has started to properly kick in I thought I would start with this. Winter climbers, why is it that we all share the common attribute of being forgetful? Now this may sound stupid but I say this because what other excuse can we possible have for continuing to return to dark and frozen lay-by’s, at unearthly hours of the morning, just to kit up for another torturous walk-in, that only a few days before, we swore we would never put our bodies through again!? Now either this is the proof that we are all entirely forgetful, or we are all just bloody mad! either way, this ability for us to just forgive and forget everything we put ourselves through at that very second we reach the summit of that chosen route, has always astonished me and has got me thinking about the weird ways in which our sport affects all of us climbers. 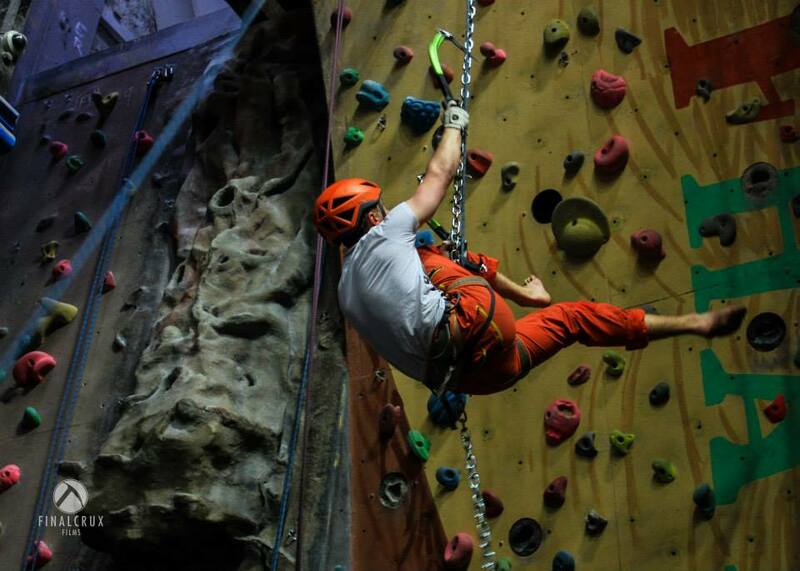 When you start to look into the odd relationship us climbers have with our sport its funny what you see. From winter climbers being able to forget the perils they go through to get to climbs, to the trad climber that pleads with fear for respite. It seems like it’s possible that we actually create some sort of ‘bond’ with our routes. One minute its the climb that you hate as you struggle up the moves. The next minute you are blessing the same route, that very same climb, all just for revealing that placement for that ‘bomber’ piece. We begin to create ‘attitudes’ towards climbs and these change depending on how the route affects us. Our sport can cause us to be happy, scared, relaxed, tired, nervous and in some cases even obsessed. Climbers travel thousand of miles, put their body through hell and back, push themselves close to a mental breakdown and all whilst putting themselves in life risking situations all for the chance to complete a certain climb. Now when you take a step back and break it down as simply as it can be put, the definition of a ‘climb’ is just a specific path up some specific rock. It seems crazy how something as simple as that can take a hold of us so easily and have such a power over us. Ultimately this all ties in (see what I did there!) and leads (there too!) to the question that I don’t think any one of us will ever be able to give the specific answer to. Now some people dislike that we have no pinpointed explanation for this, some people I know just don’t care. On the other hand, I personally love that we can’t explain our obsession, it leaves a sense of the unknown within us. Why do we risk everything for that chance of success? Are we climbing to see what we can achieve? Or is it as basic as we climb because we can? 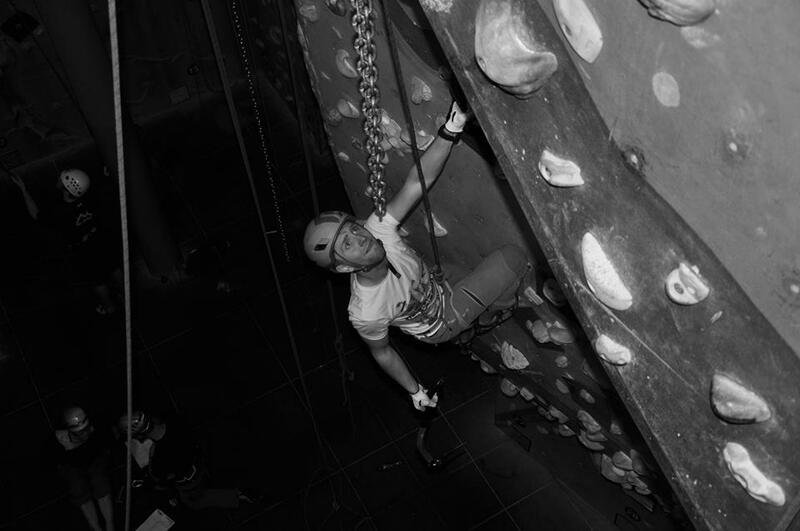 You might be the indoor enthusiast who questions why you’ve been training on the fingerboard for the last 3 weeks just to gain that extra strength you need for that route you just can’t quite do at the centre. The bouldering fanatic who wonders why you stayed and shredded the remaining skin from your tips when you should have left an hour ago with everyone else, just for the chance to get the top out of that long-term project. The Trad climber who questions why you risks it all as the crux approaches, 40 meters up, one RP placed forever ago, and sever ground fall potential, all for the success of your hardest tick to date. Finally The mountaineer. Who questions why you put yourself in one of the most hostile environments on the planet, risk horrific conditions, consistent pain, cold and danger, all to stand upon that faraway summit. 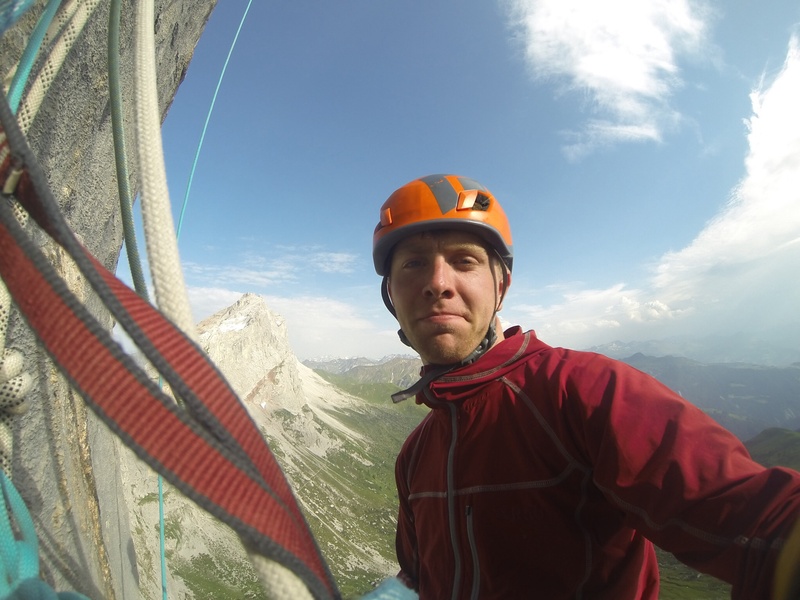 No matter what type of climber you are, or the answer to why you climb, it’s a question that will continue to arise in every climbers head at some point, and one that can drive you mad looking for answers to. If you’ve managed to work it out, you’re a smarter man (or woman) than me, and if this is the case, I’d love to hear your thoughts. If you’re like me and stand clueless then try not to fret about why we do it, just be happy to be part of a sport that pushes us in so many more ways than just physically and forces us to break the boundaries of our limits, even if it is in the name of madness!